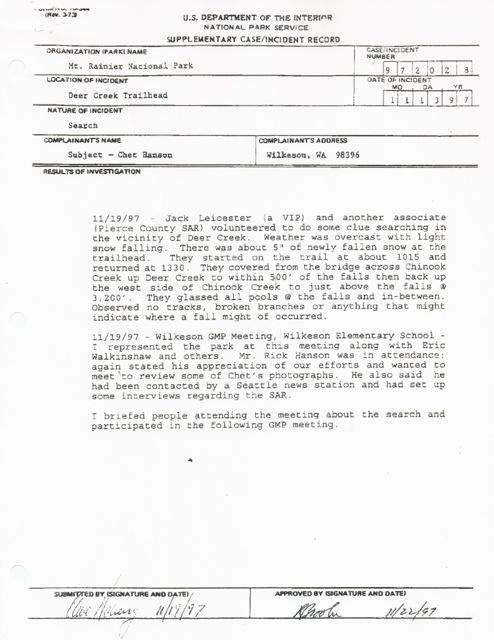 This page will highlight cases where the missing has not been found and where our research indicates it meets the criteria for investigation. 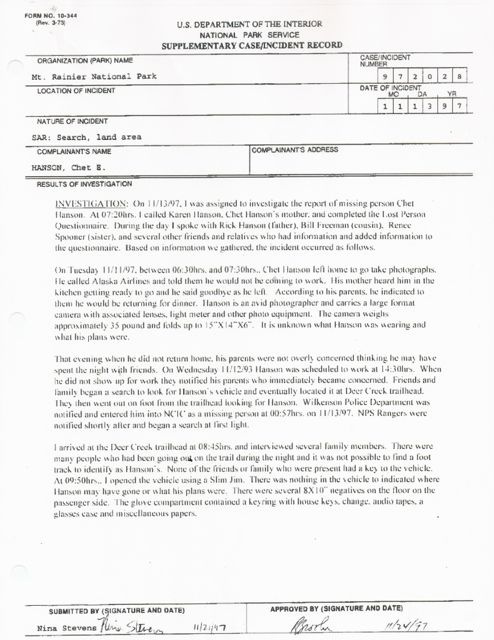 Many of these cases include documents which were obtained through the Freedom of Information act (FOIA) and we have included them to give the visitor a personal look of what truly happened in that incident. 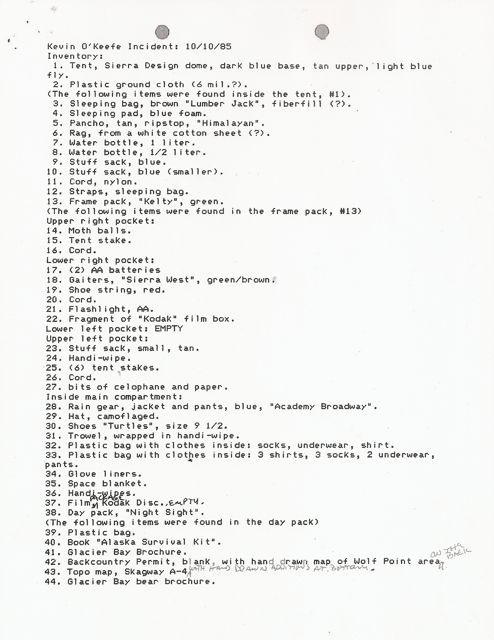 The following pages were received from the National Park Service and represent the entirety of their case file on Mr. O'Keefe. There are several aspects of this case which are very disturbing and we will discuss them at the end of the report. 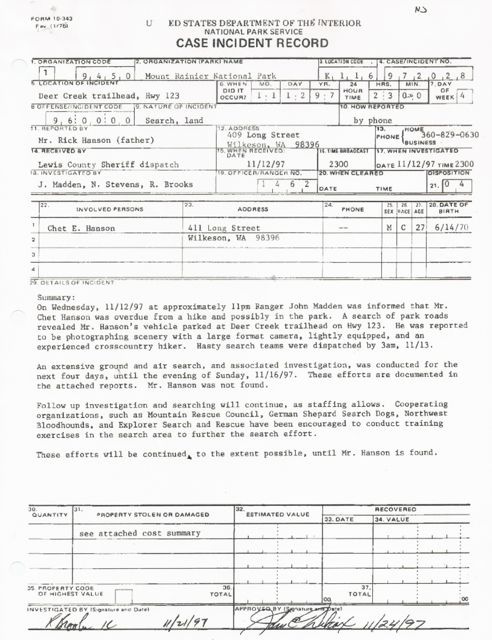 The only report we did not upload which we did receive from the NPS were maps. 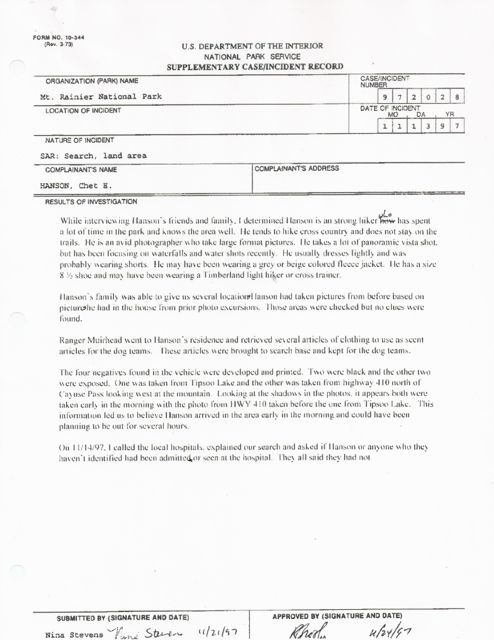 On page one of the NPS report, paragraph one, last sentence the rangers make note that they found O'Keefe's tent with a broken center pole. 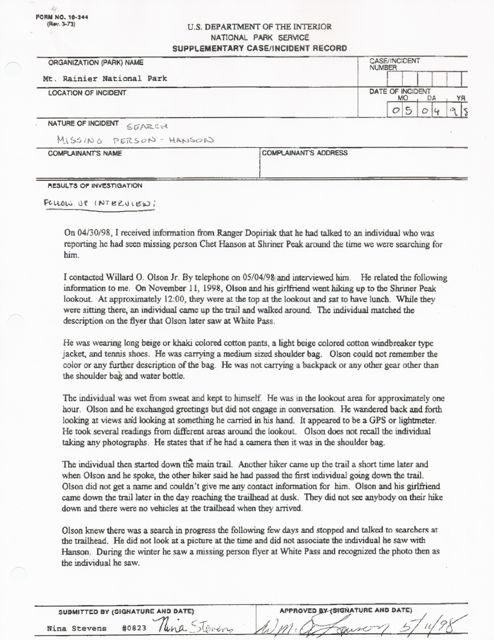 NPS personnel believed that the victim was out for a day hike and secured the tent and left the belongings they found in place, they would return the following day. 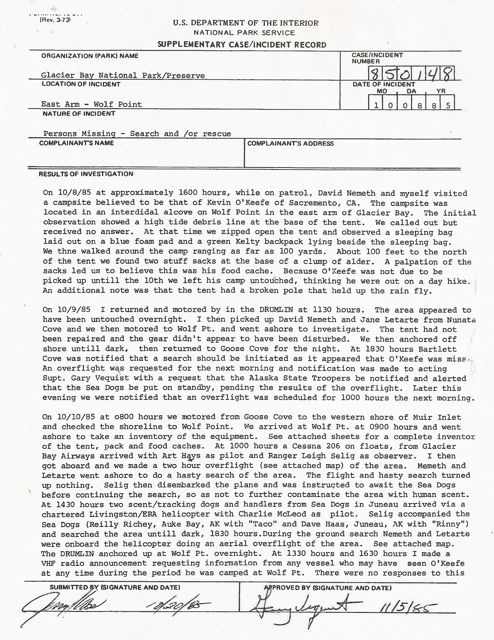 The day following the initial discovery of the tent, rangers went back to the campsite and again checked to see if the victim had returned, he had not. 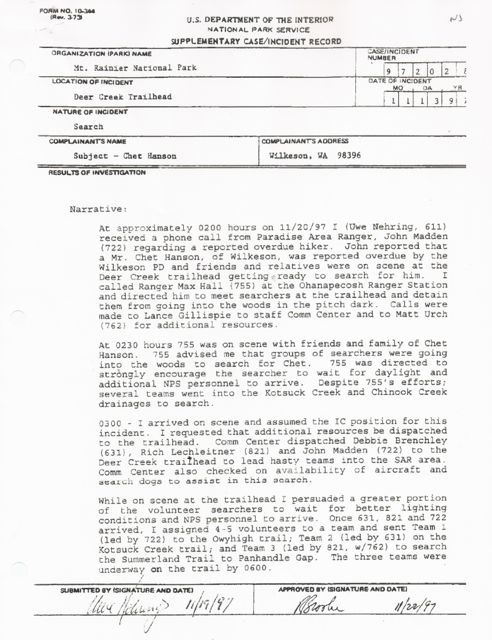 Rangers left the scene, notified Alaska State Troopers and then asked for additional assistance to search the campsite location. The second day following the initial discovery of the site, NPS officials did an air and ground search failing to find the victim. NPS was able to contact relatives of the victim and they did confirm that he would be making short day hikes from his primary location and would not be making overnight trips. 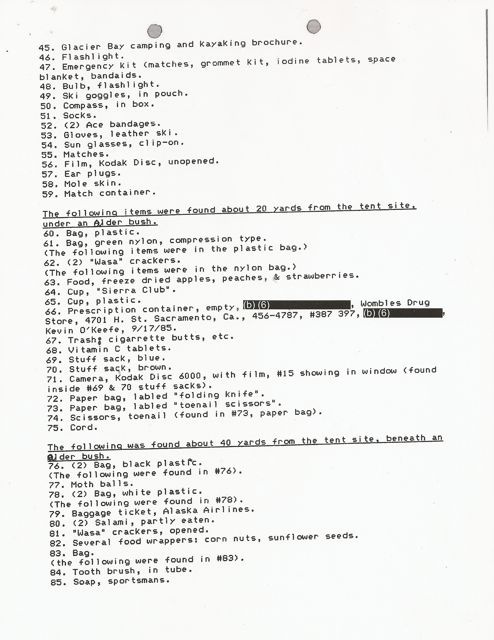 Rangers did find a variety of supplies belonging to the victim at several locations near and far from the camp site. The victims sleeping bag and backpack were found at the scene, confirming he did not voluntarily go anywhere anywhere overnight. 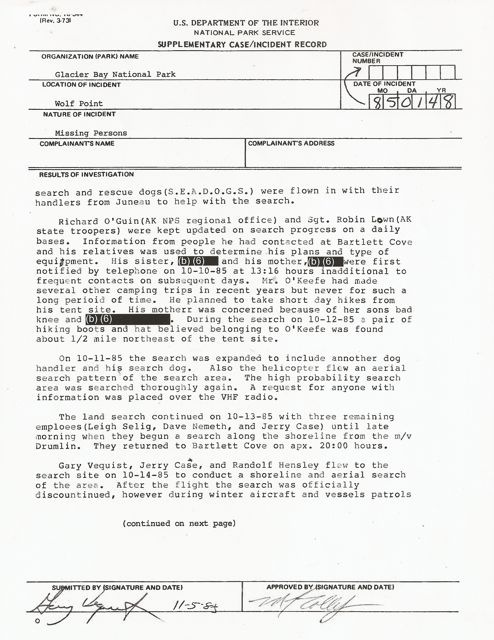 They also found his day pack, indicating he had not left the scene for a day walk. One major issue of concern in this case is that searchers found the victims boots and knit hat several hundred yards from the campsite. Several hundred yards from this site searchers also found a glove liner belonging to the victim. Nobody will live long in Alaska in any season without adequate footwear, and Mr. Okeefe was without his boots, something no rational hiker would ever voluntarily discard. It seems extremely odd that his glove liner was also found quite a distance from the primary site, a discomforting find. 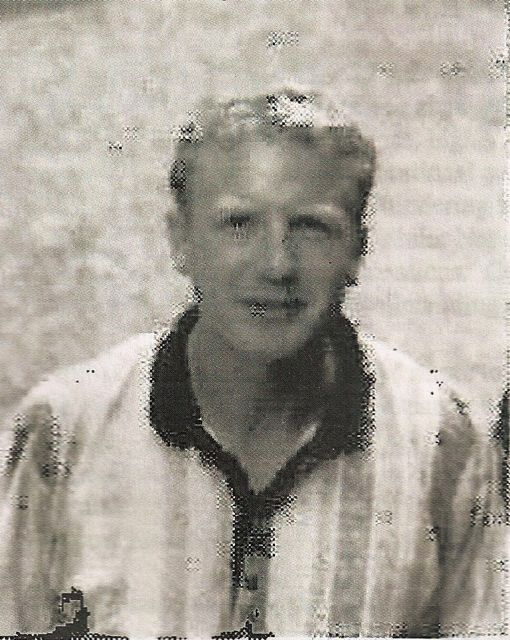 We do know of several other campers who have disappeared under very similar conditions. A broken pole inside of a tent indicates that somehow the tent was pushed down breaking the pole. 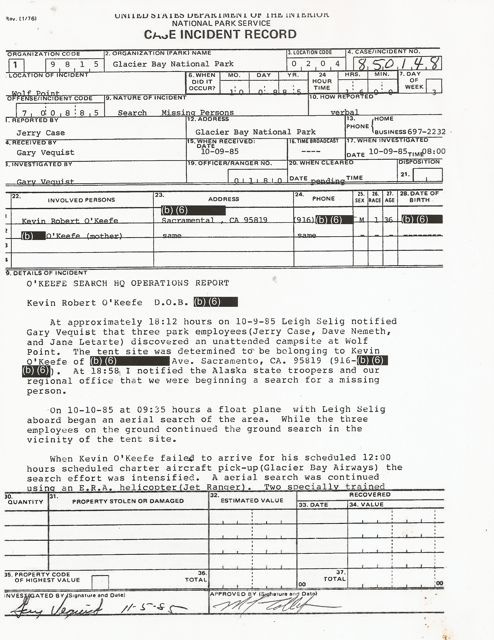 Visitors to this site may find this highly unusual but once you have read thousands of missing case files involving finding campsites, this is not that uncommon. It is also not uncommon to find clothing belonging to the victim, clothing that would not be normally discarded (Boots, gloves, etc). 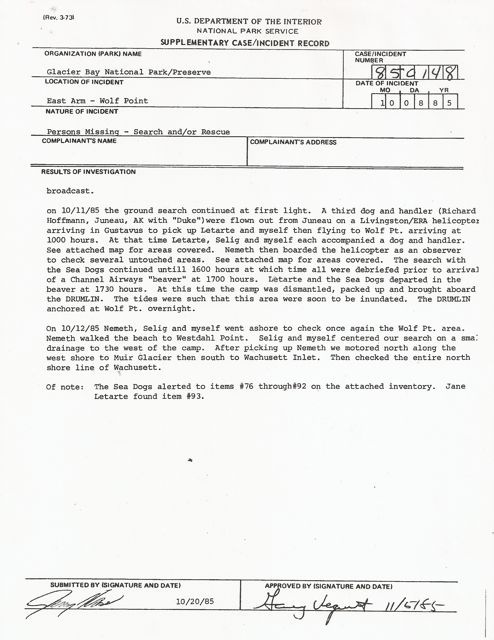 A review of this case leads CanAm investigators to believe that the victim was either asleep in his tent or somewhere near his site when a very unusual and catastropihic event took place. 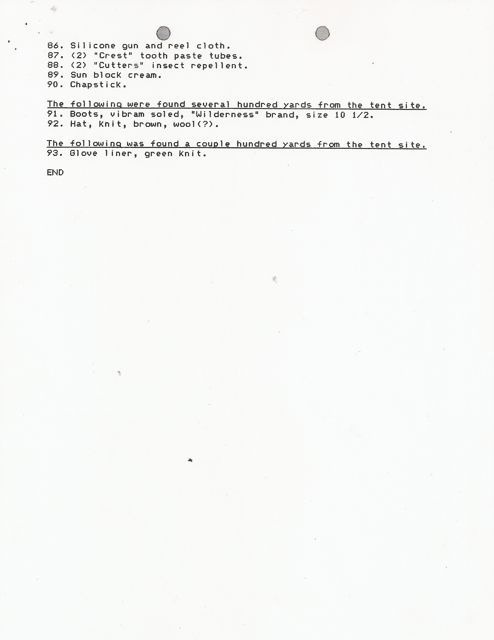 All of his provisions for survival were at or near his primary campsite. No, we do not believe that a bear attacked the victim or his site as food and other supplies were laying on the ground in the area undisturbed and there was no blood or other signs of s struggle noted by NPS investigators. 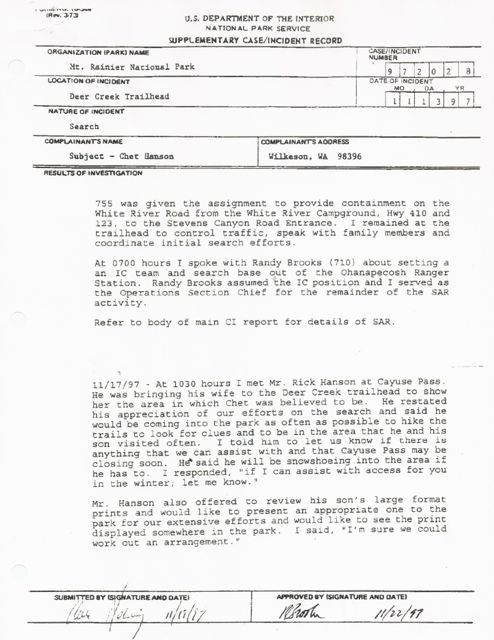 National Park Personnel established that Chet was a "strong hiker" who went into the back country to photograph a lake he had been to many times. He was carrying a large camera and tripod in his effort to capture winter near Rainier. It does not make sense that Chet got lost. He had been to this area many times and knew the area well. It also does not make sense that Chet was brought down by an illness, he was young and strong. He had to be in great shape to hike the region with a camera and gear weighing in excess of thirty five pounds. When people are lost in the wild and start to become weak and tired, they start to drop items and leave bags behind, nothing of substantial value was found belonging to Chet. The fact that items were not found is not a good sign. Bloodhounds and canines could not locate Chet. Cadaver dogs could not locate Chet. The odor of a body as it disintegrates is something that travels for several miles, it's a very identifiable odor, this was not found. The region around Mt. Rainier is where many people have vanished over the last century. I doubt that Chet E. Hanson will ever be located.